From the very moment you feel your little one begin to kick in your tummy to the moment they run in their first sports day, we’re very aware that children love to move! Pulling themself up to standing and taking those tentative first steps, it’s amazing to see how their bodies change and adapt. Movement provides a plethora of essential feedback which develops the child as a whole. In the first years of childhood roughly 90% of the neural pathways in the brain will be set for life. This comes from movement. As soon as a child is able to move, receiving information through their 8 senses (yes 8 senses! More to come on that…!) they begin to create the building blocks for later higher level learning. Movement at The Fern Club is at the heart of everything we love. From the very smallest fine motor skills to weight bearing and beyond. We love knowing that each movement experience is setting the child up for learning later in life. We want to step away from the pressures of formal learning and focus on the whole child, on their whole brain experiences. 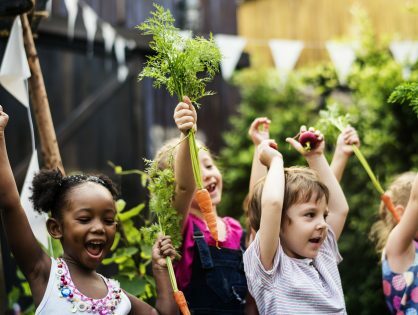 The more your child is able to move and experience their surroundings, the more synapses fire in their wonderful brains creating connections ready for higher level thinking. If your child has a weak core, how will they maintain an upright position at school in their chair? If they have low muscle tone in their arms, how will they hold their pen correctly and for longer periods in order to learn to write? Each time a child moves, it stimulates an amazing sense, the vestibular sense. This is the first sense developed in utero. It plays such a vital role in a person’s life and most are unaware of its even existence. Situated in the inner ear, the vestibular system is responsible for so much; balance, directionality and retina stabilisation to name a few. This sense has an impact on nearly everything we do in our day to day lives and yet it’s so often overlooked. The most challenging aspect of balance is actually staying stationary! The best way to learn to be still is to move against gravity; with their bodies or eyes. In order to have our little ones play with a sensory bin, to learn at a desk or read a book, they must have an age appropriate developed vestibular system. This of course comes with practise and time. During classes at The Fern Club you’ll notice we encourage children to get out of their normal operating planes i.e. going upside down to see letters, using their feet to paint or log rolling whilst playing hide and seek. These challenges stimulate the fluid in the inner ear, challenges the retina to maintain stability and forces the vestibular system to connect with their muscles to maintain control. “The more a child moves, the more a child knows, the more a child knows, the more they want to know and the more the child wants to know, the more a child needs to know” (A Moving Child is a Learning Child – Connell and McCarthy 2014). At The Fern Club we appreciate the vital importance of early childhood movements and its role in later learning. Our love is in encouraging the child to use their bodies and brains to have fun and experience the incredible world around them. You’ll see during our classes the opening section is movement based; pure and simple inquisitive play! Whether that’s using those fingers for some small parts play or their whole fantastic body to balance and spin. We know kids learn best when they’re having fun; when the class begins children are encouraged to move and play, it sets the tone for the whole class!